Of his life was a turning point in the history of Tamil Eelam liberation struggle! This article is based on two of my talks; one is given at the Trans-national government of Tamil Eelam office at 5210 Finch Ave. Unit 24, Scarborough (Middlefield and Finch) on 5th of June, 2018 and the other talk is on 10th of June, 2018 at Urumpirai citizen’s meeting held at the Baba banquet hall. In these talks, I quoted Mr.S. Sivanayagam’s book Srilanka: Witness to History, pages 169 & 170 “Events were beginning to move rapidly thereafter. Young violence was met with police crackdown and a wave of arrest leaning in turn to popular unrest. Some of the activists like Kuttimani and Sathyaseelan were already behind bars. Policemen and pro-government politicians became targets of attack. Banks were robbed to fund armed militancy. On June 5, 1974 young Sivakumaran swallowed cyanide and died when surrounded by police. His was to be the first of many such cyanide deaths. He was given a hero’s funeral accompanied by an outpouring of popular emotion. Prime Minister Mrs. Bandaranike who with no expense to the government converted Parameshwara College, a secondary school founded by Sir.P.Ramanathan, into a university campus, thought she was gifting Jaffna with a university and sallied forth the opening ceremony. A new wave of violence greeted her visit. Bombs were thrown at a police jeep and in Jaffna town and an attempt were made on the life of Alfred Durayappa who organized the Prime Minister’s visit. Sivakumaran was born in the village Urumpirai, Jaffna on September 26, 1950. September has its significance as regard to the birth and death of great Tamil personalities. To start with Father Thani Nayagam (a priest) who died on September 1, 1980 and in between many Tamils scholars, politicians and heroes also were born and died. The hero Thiliben [Thileepan] died on September 26, 1987. Sivakumaran was the fourth child in his family. Likewise Prabhakaran was also the fourth child in his family. Sivakumaran’s father Ponnuthurai was a principal of Urumpirai Hindu Tamil Vidyasalai and his mother Annalakshmi who carried Sivakumaran in her womb and the entire family was infused by Chelvanayakam’s political thinking. In 1969, he was militant supporter of Thangathurai, Kuttimani and Pirabhakaran. The student movement was lead by Ponnuthurai Sathiyaseelan. Sivakumaran was out to fight against the cultural affairs minister Somaweera Chandrasri who was a Sinhalese extremist. Sivakumaran placed a time bomb under Chandrasri’s car but when the bomb exploded no one was in the car. In February 1971, Sivakumaran tried to assainated Duraippah by throwing a hand grenade; it too failed. In January 1974 nine civilians were massacred by the police at the World Tamil Conference held at Jaffna. Though Tamil militants blamed the government and the post telecommunication minister Chellih Kumarasuriar for the massacre but Sivakumaran blamed Duraippah, the Mayor of Jaffna and S.K. Chandraseka for the massacre and sought vengeance. On June 4, 1974 Tamil militants including Sivakumaran attempted to rob People’s Bank in Kopay. Here too he failed and swallowed a vial of cyanide instantly. 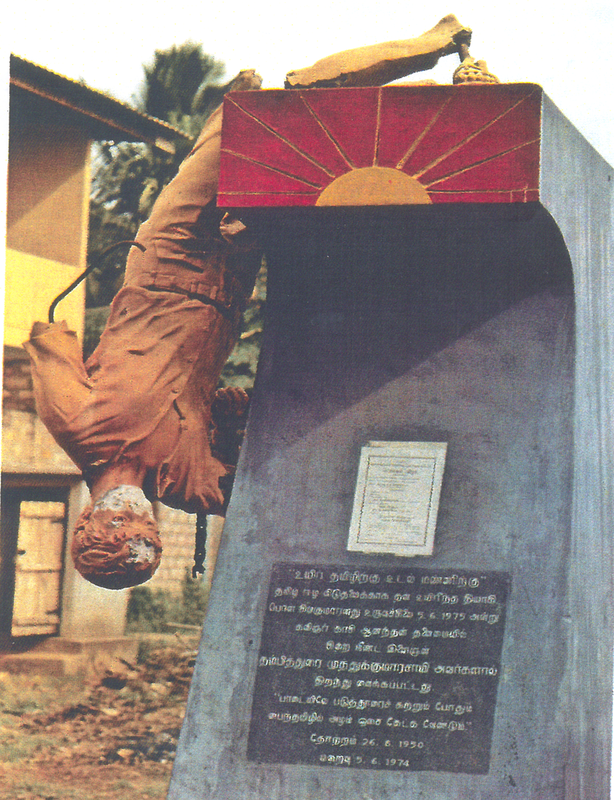 Sivakumaran became the first Tamil militant to die in such a manner and is considered as the first Tamil martyr. The crowd that attended his funeral was unprecedented in the history of Eelam Tamils. Prabhakaran openly declared that Sivakumaran’s death was the inspiration for LTTE cadres carrying the cyanide capsules as standard equipment. A bronze statue that was built for Sivakumaran was destroyed three times and it’s the fourth statue that is standing there now. Sivakumaran died at the age of 24 and 44 years have rolled down but his memory is enshrined in all our hearts. His supreme sacrifice is unique. Future generations will remember him with deep gratitude and history will record as an unforgettable chapter in the Tamil Eelam liberation struggle. The best way to remember him is to live for his ideal and the sacrifices he made for our liberation struggle. Aravindo, the freedom fighter and spiritual leader of India, he once said “You must fight for what you believe in, but the present circumstances may not be in your favor but future event will shape in the way you want”. Let this Mantra be our guide to liberate Tamil Eelam. Posted June 19th, 2018 .